Today for the Haiku Heights April Challenge 2012 topic is of our choice, so I thought to write on 'Certain' . I hope all the participants and readers will like this. Nature's cycle goes on, so on the changes and this is the certain beauty of life. Sanskrit spiritual verses are small, but they have great deep meaning and power, so they are very divine, I realized the same beauty while writing the shortest poem like Haiku. We had different prompts to write and while writing I discovered the same beauty of Advaita philosophy, devotion, spirituality in the prompts given. 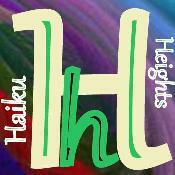 I can't express the bliss I am feeling, while participating and reading the Haiku from all the great poets. Tomorrow will be last day of April, I will never forget this first Haiku Challenge and April 2012 month. I wish to thank all the poets, for encouraging me and for sharing their wonderful Haiku and thoughts. Beautiful journey indeed. I have enjoyed reading your poetry - today and all the other days - thank you for joining and thank you for your kind words about the challenge. Love this set of haiku, nicely composed. I'm glad you found the blissful comfort of haiku. Both are beautiful Mohini!...beauty of nature is endless...How true!